Salsa Red is a single-type, orange-red (salsa) coneflower in the SOMBRERO series of Echinacea cultivars introduced by Darwin Perennials. Easily grown in average, dry to medium moisture, well-drained soils in full sun to part shade. Best in full sun. This is an adaptable plant that is tolerant of drought, heat, humidity and poor soil. Divide clumps when they become overcrowded (about every 4 years). Plants usually rebloom without deadheading, however prompt removal of spent flowers encourages continued bloom and improves general appearance. 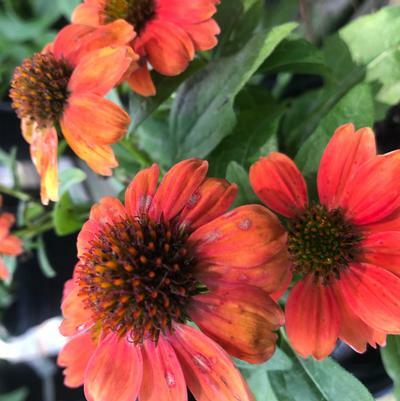 This is an compact, upright coneflower that typically grows in a clump to 22-24” tall and to 16-20" wide on sturdy stems that do not need staking. Each mildly-aromatic flower (to 3" diameter) features drooping, showy, deep orange-red rays in a single whorl (about 25 rays per whorl) surrounding a sombrero-shaped, orange-brown center cone containing numerous (to around 300), tiny, spirally-arranged disk florets.